In the preceding chapters my primary focus has been on late medieval songs and their performance. In this final chapter, I will discuss the conceptual frame that divides sacred and secular music in musicological thought and practice. Finally, I will analyze a work of music categorized as sacred using the analytical tools developed through my investigation of secular songs. 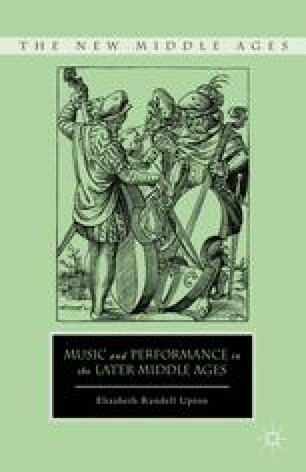 In this way, I demonstrate how attention to songs and their evidence concerning performance and the medieval musicking process can further understanding of all surviving music—both secular and sacred—and the people who wrote, performed, and heard them in the early fifteenth century.